Sgt. 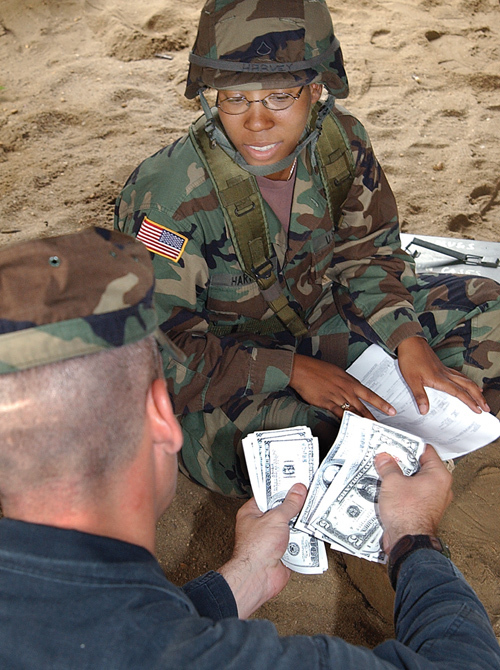 1st Class David DeMarco (front), HQ 50th Finance Battalion counts the cash delivered by Pfc. Jamie Harvey (back), 350th Finance Detachment. Members of the 50th Finance Battalion came to Fort Dix in July for a unique field training exercise (FTX). Their mission was to secure two buildings and set up a military pay station in a forward position. The problem is, they had to do this in the most hostile of conditions, under enemy fire, in an area littered with mines and Improvised Explosive Devices. The Battalion is not wholly unfamiliar with this type of scenario as the unit spent one year in Iraq facing such obstacles. "We’re trying to recreate the conditions they encountered in Iraq,” said Maj. Christopher Eads, executive officer. “I do expect them to be surprised even though they have run across this before. We’re gonna hit them with a lot more than they’ve ever been hit with out in Iraq,” he said. “Anytime they moved out on a convoy mission to deliver funds to contractors and other units, and when they did that they encountered enemy fire, either IEDs, small-arms fire, sniper fire, mortar fire, and this is pretty close to that,” said Lt. Col. Angelo Capolupo, battalion commander. While the unit never had to secure their own areas in Iraq and the training seems a bit over the top for a finance unit, the FTX did prepared the Soldiers to be ready for any scenario. “The bottom line is we’re trying to challenge our troops and take it to the limit on this in the event,” said Capolupo. While the Army always tries to keep training as realistic and true-to-life as possible, there are certain factors that will never echo the real thing, according to Sgt. 1st Class David DeMarco, 50th Finance Headquarters Detachment sergeant and leader of the opposition forces. 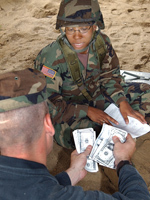 The training the 50th Finance performed is designed to get the Soldiers to react instinctively in spite of distractions. “They cleared the two buildings, had five casualties, consolidated, called their nine lines in, got their wounded out, got reorganized, took the buildings and conducted their pay missions,” added DeMarco. Sgt. 1st Class Fran Watson, 350th Finance, takes up a defensive position during the 50th Finance Battalion’s Field Training Exercise at Fort Dix.